Last night, Capcom revealed the expected: Resident Evil 6. Today in Tokyo, Capcom followed up the debut trailer with an event to showcase Resident Evil. According to game developer and Twitter user Cvxfreak, Capcom said that it was aiming for the highest quality possible with Resident Evil 6. The game takes protagonists Leon Kennedy and Chris Redfield from the U.S. to "A Certain City in China" to stop a deadly virus. Besides Leon and Chris, there is another male protagonist, but that character's name is currently secret. The female government agent who is Leon's partner is Helena Harper, Cvxfreak tweeted. In the trailer, there is a nasty, mutating and regenerating enemy with bulbous sores called "Javo". The game's gameplay is centered on fear, excitement, and amazement, and players, Cvxfreak tweeted, have a wide array of moves at their disposal, as evident by the beatdown Leon unleashes in the trailer. What's also evident is the sheer size of the game. 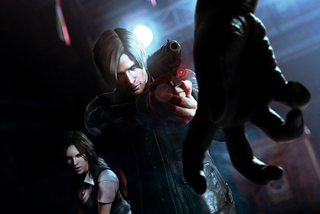 Yoshiaki Hirayabashi, the game's producer, said Resident Evil 6 would have the largest scale of any RE released so far. As Kotaku previously posted, Resident Evil 6 takes some ten years after the after the Raccoon City incident. It begins with the President of the United States about to reveal the truth behind the incident to the world at large. Unfortunately he instead transforms into something hideous due to a bioterrorism attack, causing his personal friend and bodyguard Leon S. Kennedy to clean up the mess. In case you missed it, check out the game's debut trailer.